Grasberg Mine, Gold and Copper, Papua, Indonesia. Map and News. Elearning. 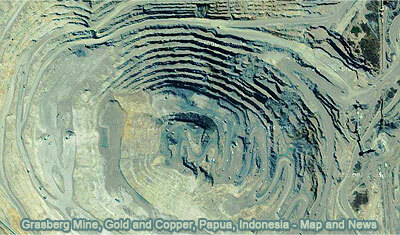 Explore the geometry of the Grasberg Mine in Papua, Indonesia, through detailed Google satellite imagery. To Pan: click and drag the map. Take advantage of the zoom bars. The Grasberg Mine is the largest gold mine and the third largest copper mine in the world. It is located in the province of Papua in Indonesia near Puncak Jaya, the highest mountain in Papua," Source: Wikipedia: Grasberg Mine. See also: Grasberg Mine, Open Pit Art.